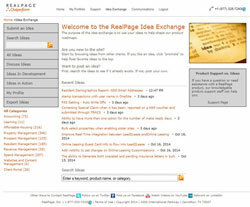 The Idea Exchange is an open forum for user community to share and discuss ideas on improving RealPage products and services. You can share your ideas, review the ideas of others and vote on ideas you think are good ones. Submit your enhancement suggestion as an idea. View popular, new, or recent ideas. Promote ideas submitted by others. Review comments added to an idea. See the ideas that are in development and those that are in production. Tell us what you would like to see improved in the product. After an idea is submitted, it is available to the RealPage community for review. People can promote your idea and add comments. An idea is promoted by clicking the “thumbs up” or “thumbs down.” Each time someone votes “thumbs up,” the idea gets 10 more points. Each time someone votes “thumbs down,” the idea loses 10 points. The point score shows you which ideas are doing well and getting more responses. We encourage you to review the ideas periodically to see what clients are requesting. Show support by promoting the ideas you want to see implemented and adding your comments. You can only promote an idea once. You can’t change your vote. You can’t promote your idea. Product experts monitor and evaluate all ideas. They periodically run reports and communicate ideas to subcommittees for discussion. The Idea Exchange plays a critical role in helping RealPage prioritize new ideas for solutions that meet the needs of clients. Twice a year, ideas are reviewed by our user group subcommittees. Together, RealPage and subcommittee members collaborate to select ideas for product development. Ideas are submitted through the Idea Exchange, located in the RealPage Client Portal.